Douglasville Ga is a suburban town of West Atlanta is situated due west of Atlanta, Ga about 32 miles and is the county seat for Douglas County. 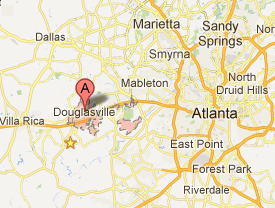 The 2010 census listed the population of Douglasville at 30,961. Residents commute daily to surrounding suburbs and downtown Atlanta traveling via interstate I-20 which runs east to west to Atlanta. Residents enjoy suburban life with many swim and tennis communities throughout Douglas County, some of the area's newest schools, access to great shopping and dining, local parks to enjoy all with the convenience to Atlanta and the Atlanta Hartsfield International Airport which is only about 40 minutes away.